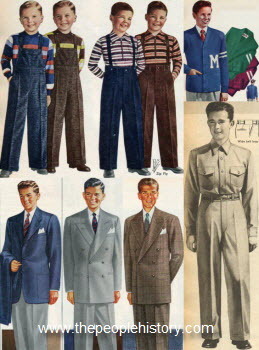 Description Styles for boys clothing in 1950 include a variety of gabardine suits for boys and teenagers, corduroy bib and suspender longies for playwear and casual clothing, the ever popular award coat sweater for high schoolers to show off their clubs, and work outfits made of rugged army twill. 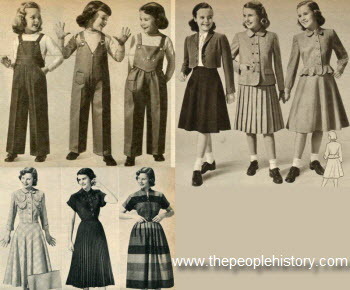 Description For girls in 1950 skirt and jacket suits were popular and reflected styles that were also prominent in women's fashion like pleated skirts, bolero jackets and scalloped edges. 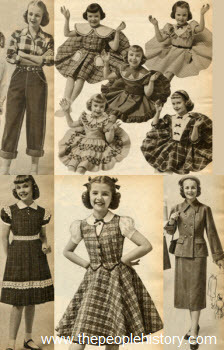 Cotton overalls for younger girls' playwear were also popular and featured a variety of bib styles. 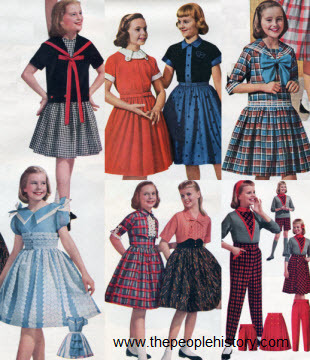 For teenage girls dresses featuring plaids, fun stripes, and various novel features were the favorites. 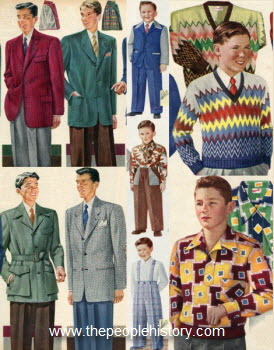 Description In 1951, sport coats and slacks came first in the teenage boy's wardrobe, as well as fun patterned sweaters and flannel shirts. For younger boys, plaids, corduroy, and frontier knits in various styles. 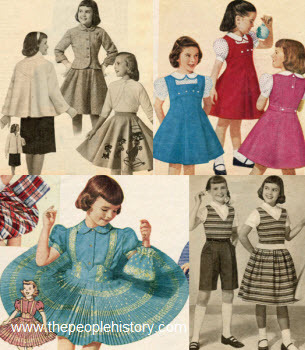 Description For young girls, frilly dresses with ruffles, checks, plaids, and stripes. For older girls, a more toned down and simple line for dresses with menswear details, bow collars, pleats, belted dresses and pocket details. 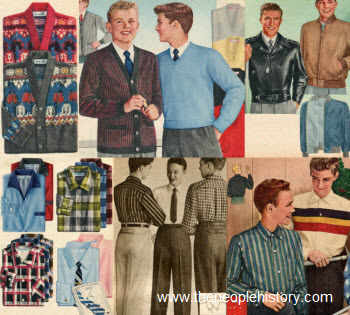 Description For the boys of 1952, fashion dictated bold colors in bright check patterns and fun plaids. The "dickey" pullover and the "vestee" pullover were perfect complements to any outfit for teenage boys. 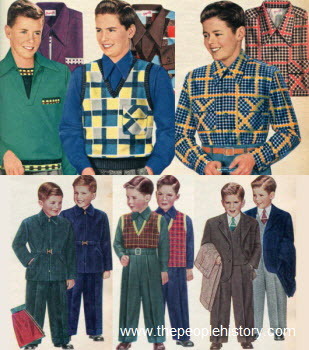 While corduroy playsuits and rayon shirts and longies were great for casual wear, small three and four piece suits were great for formal occasions. 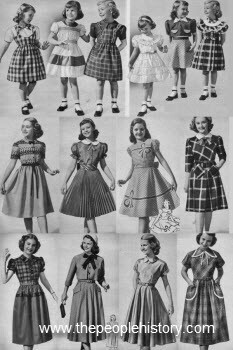 Description In 1952, circle skirts were popular for young girls, as well as quilted cotton skirt and vest sets and Magic-Grow dresses that could expand to adjust for height growth. Cuffed denim pants were also popular for work and play and would usually be accompanied by flannel or cotton shirts. 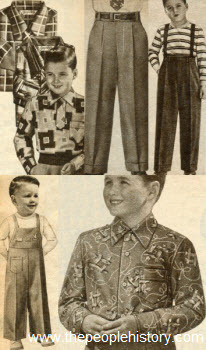 Description Flannel lined denim outfits were popular with boys of all ages and could be easily paired with corduroy shirts, flannel plaids or western style cotton button-downs. 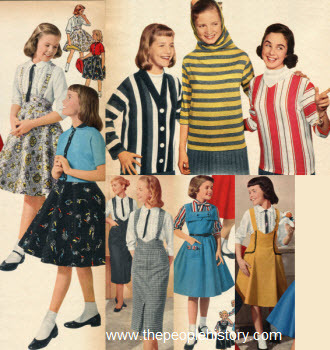 Description Sweaters and skirts in wool and velveteen were popular for teenage girls in 1953. 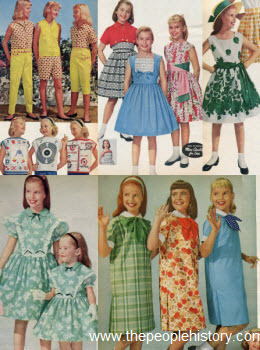 Younger girls wore dresses of chromespun acetate taffeta and nylon blouses. 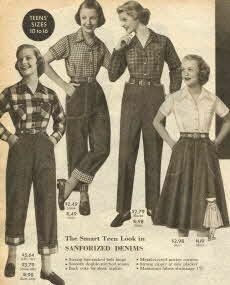 And, denim slacks with flannel lining and shirts were popular with girls of all ages. Color-blocking, check patterns, plaids and stripes featured predominantly that year. 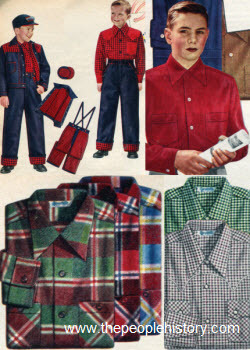 Description The boys of 1954 were featured in western flannel with bright and unusual patterns and plaids. They wore dressy longies or corduroy suspender longies dependent on the occasion. And for the youngest of them, the training overall made of pinwale corduroy was a fashionable staple. 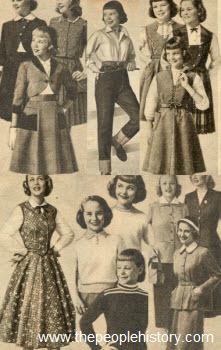 Description In 1954, girls' and teens' suits were perfect for school as well as pullover sweaters, fashionable jumpers, skirts and quilted cotton sets. Denim jeans with fly fronts were great for long-lasting casual comfort. Description Denim outfits were the way to go in 1955. Practical and comfortable leisure wear, denim jeans needed to be worn with a denim jacket. For school or important events teen boys could pick up a two piece suit featuring various tweed or corduroy textures and fun but subtle patterns and colors. For the younger boys sport suits and dressy outfits resembled miniature versions of what a father might wear in casual or formal settings. 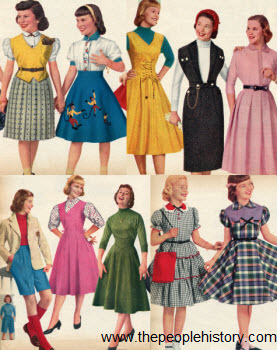 Description Girls in 1955 could choose from a widening range of bright and fun options, including corduroy jumpers ranging from yellow to bright pink and plaid circle skirt dresses with ruffle accents, bows, and beautiful collars. Teenage girls could go for a more sophisticated look with two piece ensembles, blazer jackets, and slimmer skirt shapes. Description For boys in 1956, fine quality wool or corduroy suits were perfect for holidays or a party. Wool coats in various styles were also popular for winter weather and a toggle parka was the pinnacle of fashion. 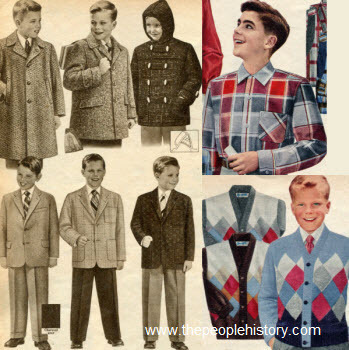 Argyle pattern cardigans and varying styles of plaid shirts were also popular. 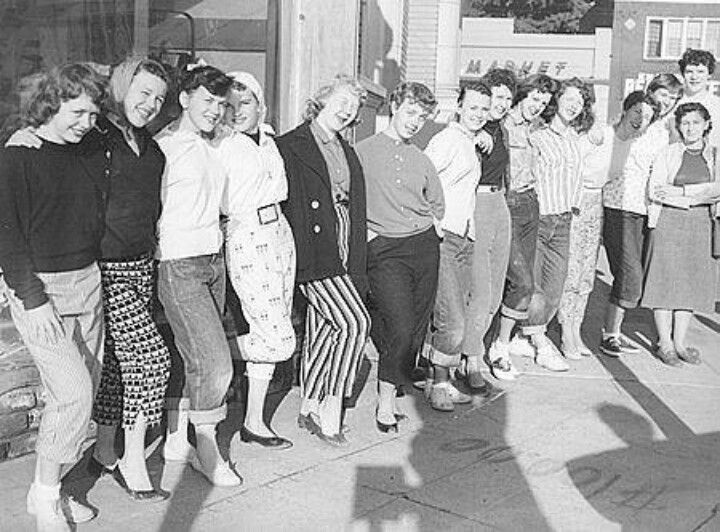 Description In 1956, girls would be at the height of fashion in their chinos or Bermuda shorts with striped pullovers or vestees. 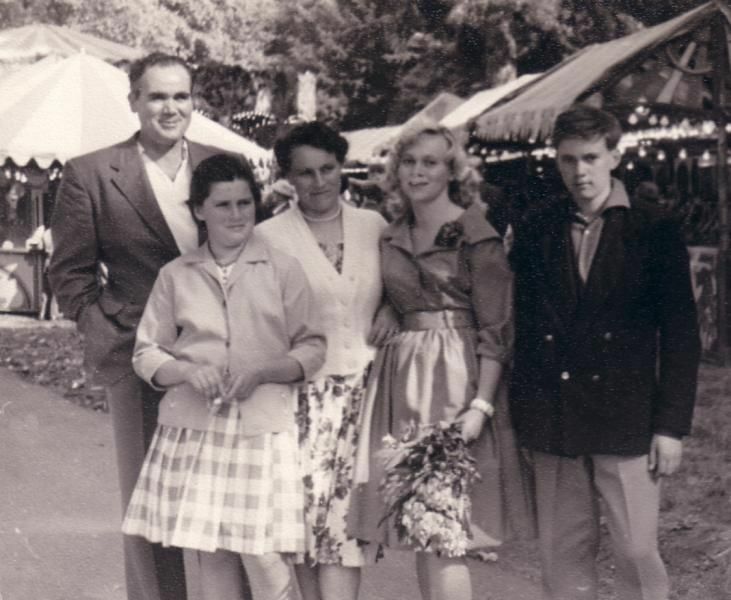 Suits, skirts, tops and jackets in wool and rayon were great for everyday wear, while pleated or quilted circle skirt jumpers were perfect for the holidays. 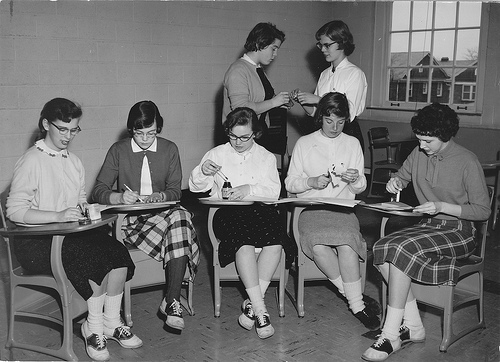 Description The preppy Ivy-league look met popularity in 1957 for boys, but leather jackets, symbol of rebellious youth, were popular as well. 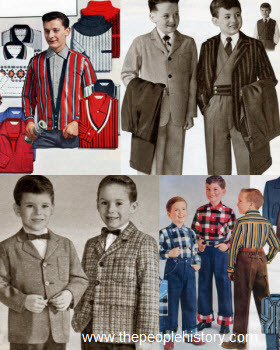 Boys and teens could choose from a plethora of cardigans, twill slacks, and collared shirts, all in stripes and checks. 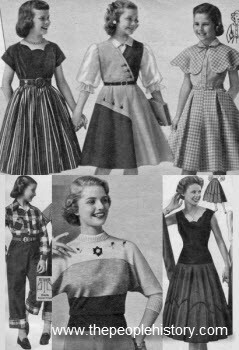 Description Hi-rise skirts with suspenders and flannel and corduroy jumpers or suspender skirts were popular for younger girls and teens alike in 1957. Cotton knit sweaters with v-necks or fun hoods were great for casual wear and looked best in fun and colorful stripes. 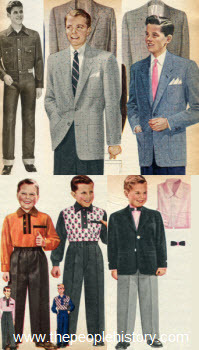 Description Again in 1958, preppy sport coats and slacks were popular looks as well as suit sets that came with extra contrasting pants. Striped pullovers and cardigans gained more popularity and the standard denim look with flannel plaid accents and shirts were a casual stand-by. Description Tapered slacks with fun patterns and matching separates became more and more popular for teens and girls and drop-waist dresses with sailor-like bow details were also popular. 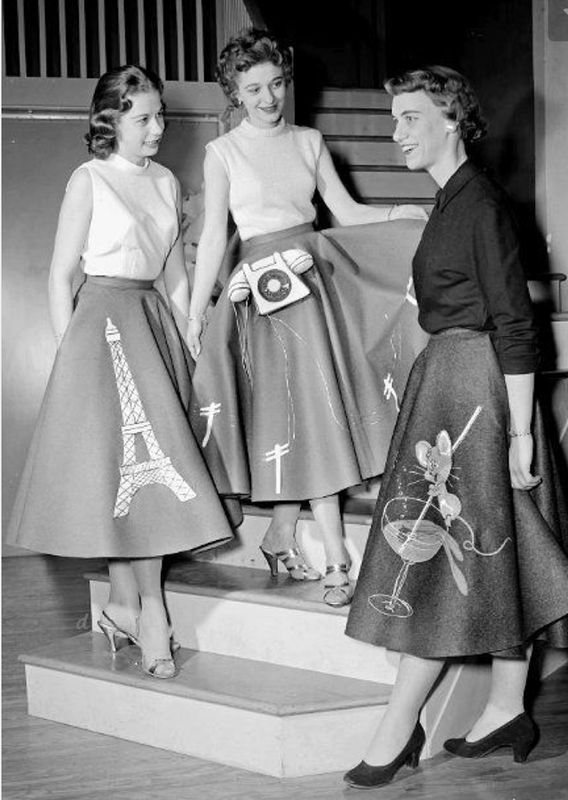 Colorful plaids and bold striped patterns were seen on skirts and dresses for all ages. 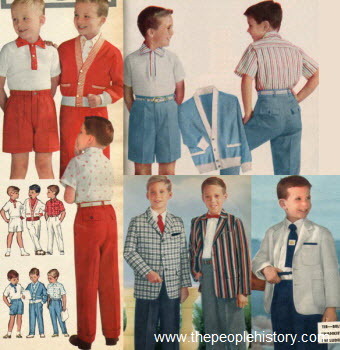 Description For the boys of 1959, colorful coordinate sets with many pieces to mix and match were the rage for summer in pastels and bright colors. More formal occasions called for suit sets featuring sport coats with novelty checks and stripes in fun and interesting color combinations. 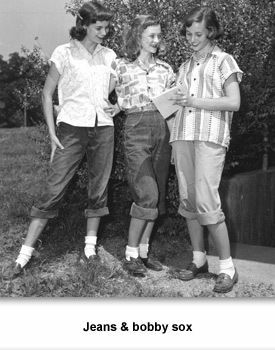 Description For girls in 1959, summer fashion was all about the most bold and colorful patterned sundresses and fun and bright separates including Jamaica shorts, pedal pushers, vestees and pop tops. 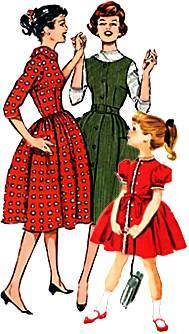 Two way dresses and sister dresses were also popular for all ages of girls.